Fire bombs are ceramic pots filled with gunpowder that are swung above the head before being released. When they explode, hopefully on impact, they burn enemies and spread flames in every direction. As even the heaviest of ships are largely of wooden construction, they are very vulnerable to fire. The fire bombs have a short range, so fire bomb ships need to get in close, attack, and then use their speed to escape before they are counter-attacked and boarded. Missile fire from other vessels can also be a threat, as there is no protection for the crew on the upper deck. These ships also have the ability to deploy naval mines outside of the deployment zone prior to the start of a battle. However, these mines are indiscriminate, and if blundered into, can be just as deadly to your own ships as well as the enemy! 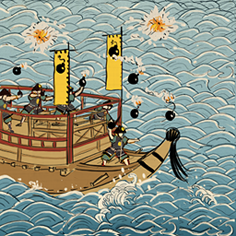 During the Sengoku Jidai, incendiary weapons such as fire arrows and bombs were used in naval battles. The bombs would be flung by hand using a rope or net sling or launched by catapults mounted on the deck. The Murakami clan managed to set fire to one of Oda Nobunaga’s ships in such a way at the first battle of Kizugawaguchi in 1576. One of the clan, Murakami Takeyoshi, was a pirate who had elevated himself into a lord through his naval expertise. His experience was so great that both the Oda and their enemies, the Mori, sought his aid in battle. Crews exploding missiles cause fires but short range.